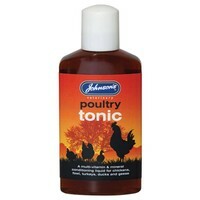 The addition of Johnsons Poultry Tonic into drinking water has proven particularly beneficial for chicks in the first few days after hatching as well as diseased or stressed birds following medical treatment or relocation. This special formula has also shown to help ex-Battery hens especially after they have been re-homed, following their retirement, to assist with feathering and sustained periods of lay. Suitable for chickens, fowl, turkeys, ducks and geese.